Tropic Marin Pro Reef salt is German-engineered with ultra-pure pharmaceutical-grade salts. This eliminates any chance of unwanted contamination, like nitrate, phosphate and ammonia, that is often found in industrial-grade salt ingredients. Tropic Marin also makes sure each batch contains all 70 trace elements that occur in natural ocean water. The high-grade salts completely dissolve due to the purity of the formulation and tight quality control. The Pro Reef formulation is intended for reef aquariums with SPS, LPS and other reef organisms that need a steady supply of calcium and magnesium for growth. Calcium and magnesium levels are higher than regular Tropic Marin sea salt. Pro Reef also has a reduced alkalinity level that complements regular use of calcium-adding supplements or calcium reactors. Lower alkalinity is believed to help corals calcify and grow faster. You’ll find that it will be easier to maintain the pH and alkalinity when using calcium and magnesium supplements or reactors. 10% weekly water changes are recommended when using Pro Reef salt. Tropic Marin: A strong foundation in science and hobby: The successful methods and techniques of today`s marine aquarists are the result of a close collaboration between serious hobbyists, scientists and specialists at public aquariums. Tropic Marin came about in exactly the same way over 30 years ago! This close cooperation resulted in one of the first complete one-part synthetic marine salt mixtures that provided the optimum natural environment for the professional as well as the private aquarist. I love this salt, it really makes my corals grow! Mixes well. Stable and clean. 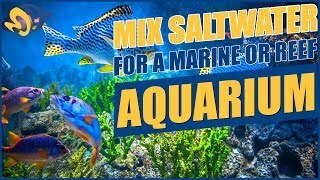 Great for all reef tanks. Was previously using Red Sea and so far I prefer Tropic Marin. Very fast mixing and clean. I switched to this from Reef Crystals as it matches my water parameters better for my reef. I really like how it mixes and it doesn't leave any residue. I’ve used several different brands of salt and so far this has been the most stable and clean mixing that I’ve ever used !!!! !